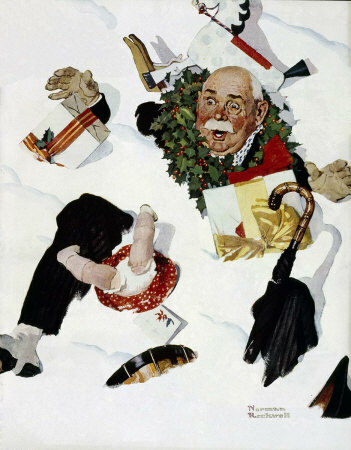 Christmas: Gramps in Snow, this Norman Rockwell painting, appeared on the cover of The Saturday Evening Post published December 10, 1937. The alternate title for this painting is White Christmas. This painting was Rockwell's 177th overall of 322 total pictures featured on the cover of The Post. Rockwell's career with the Post spanned 47 years, from his first cover illustration, Boy With Baby Carriage in 1916 to his last, Portrait of John F. Kennedy, in 1963. This was also the sixth Rockwell cover in 1937. The Post featured a Rockwell illustration on its cover six times in 1937.
on page 137 of Norman Rockwell, A Definitive Catalogue by Laurie Norton Moffatt. The original cover price was just five cents, although now a magazine in new condition sells for over one hundred dollars. Here is another famous Norman Rockwell Christmas illustration. Rockwell's mastery of story-telling on canvas shines through with this painting. Grandpa has slipped in the snow. He looks cold and suprised at his predicament. Actually, the depth of the snowdrift suggests that the snow fell on Grandpa instead. He is under the snow, not on top of it. Rockwell's mastery at capturing facial expression on canvas is evident in this painting. Gramps looks absolutely shocked. The snow probably slid off a roof or overhang just as he was walking by. It was likely just an accident. That could have happened to anybody. But it happened to Gramps. Now it is time to get up, brush off and pick up, then continue to his original destination. It's time to try to re-balance all those toys and packages. Rockwell's mastery of background detail is also evident. Just look at everything Grandpa was carrying. There is a rocking horse, a doll and a drum, as well as two wrapped presents. Christmas: Gramps in Snow was only one of 322 Norman Rockwell Saturday Evening Post covers; Here is the list of Norman Rockwell Saturday Evening Post cover illustrations. He may have been carrying the holly wreath, but it looks to my eye like it may have dropped over his head when the snow fell on him. He has also lost his hat and umbrella, though they are both still within reach. He is not worried about them right now. Right now, he is concerned with getting out from under this snow and finding a nice warm fire with which to thaw himself out.